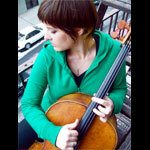 Emily Hope Price is a cellist, composer, songwriter and singer based in New York City. She is in the band, Pearl and the Beard, based out of Brooklyn, and performs and tours both with PatB as well as solo all around the great US of A. In 2004, Emily received a master's degree in Cello Performance from Carnegie Mellon University studying with Pittsburgh Symphony Orchestra Principle cellist Anne-Martindale Williams and PSO Associate cellist David Premo. Emily relocated to complete a one year post-graduate program in cello performance at SUNY Purchase with cellist Julia Lichten of The Orpheus Chamber Orchestra. Since graduating, she has performed and recorded for musicians and recording studios all over the east coast and abroad. On January 4, 2010, Emily undertook The 365 Project, a year long, song-a-day exercise that is posted and blogged about daily at www.emilyhopeprice.wordpress.com. Inspired by musician Brian Speaker, who completed his own song-a-day-for-a-year project, Spiral Notebook, Emily writes, records and posts a song everyday; the only rule being she must post one song that she has written or arranged herself every day until 2011 from any genre and can be any length. The project has afforded some wonderful collaborations with members of Pearl and the Beard, Franz Nicolay, members of Dinosaur Feathers, Matt Singer, and many more. She and her cello have recorded for Jason Schwartzman's HBO series Bored to Death as well as recording with Roger Waters of Pink Floyd, and performing with Nadia Ali, Franz Nicolay formerly of the Hold Steady, and Wakey! Wakey!, among many others, as well as performing on several national TV and radio broadcasts including NPR's Soundcheck with John Schaefer performing with Pearl and the Beard and as a collaboration with renown harpist, Bridget Kibbey. She has performed in cities across the country and globe including New York, Los Angeles, San Francisco, Pittsburgh, Miami, Chicago, Egypt, and throughout England, Germany and Romania and would love to someday live in Europe as the trees are so very nice there. Pearl and the Beard released their first full-length album, God Bless Your Weary Soul, Amanda Richardson, spring of 2009 and has been featured on NPR and AOL Spinner. On June 1, 2009, she released her first solo studio-EP, The Crux and The Bluestocking. Since beginning the 365 Project, Emily has also released 2 limited edition EPs of select 365 songs. All EHP recordings and packaging are hand-made and hand-pressed. Digital downloads of The Crux and the Bluestocking are available on iTunes and select downloads of The 365 Project will be available soon. Chris has written and recorded over 1,000 original songs and performed hundreds of shows across the U.S., Canada and Japan. He was chosen for the "Top Six" in Billboard Magazine's Indie World Series, opened a show for rock legend Ben Folds, lent songs to two independent films, received major FM radio airplay across the country, and recorded three self-released albums. His September 2009 release, "Virginia Is For Hoverers (part one)", is being described as "intimate, joyful, personal, unpretentious." Even as an independent artist, Chris's quirky, infectious style is gaining him a steadily growing following throughout the world. Chris currently resides in the bustling City of New York with his [platonic] percussionist / drummer, Brett, and they're currently hard at work on their next album, currently entitled "Virginia Is For Hoverers (Part 2)." 9:30 - Cross-Pollination set ft EMILY HOPE-PRICE & CHRIS MERRITT! !